Step back in time twenty years and snowboarding was the pursuit of the occasional adrenaline junkie, as the rest of the world headed down the slopes on two planks! These days though, things are very different. Snowboarding is one of the most popular winter sports pursuits, and it’s not just reserved for rubber bodied kids who don’t shave yet! The whole world has fallen in love with snowboarding, and everyone who is everyone takes to the slopes with a snowboard under their feet. The only problem for many is finding equipment that is of a high enough quality yet is good value. It’s hard to find such products, but the Xgames Freeride Sidecap Snowboard really does tick all boxes. From the outside looking in, this board looks like it’s got it all covered, but let’s take a closer look. The Xgames Freeride Sidecap snowboard is a fantastic snowboard for the money. When we consider that most mid range boards are on the market for twice the price, it gives you an idea of the sort of quality we might expect from this board, but the quality of construction far surpasses what would normally be expected at this price level. At only 8 lbs, this board is light enough to really turn quickly and easily, but the construction, most notably with the inclusion of carbon fibre, is as tough as you could ever need. As well as being strong, this board is also supple. The fact that the core of the board is constructed from poplar wood means that the necessary flex is there to allow you to fulfil your potential on the slopes. The quality of construction and the thought that has gone into this model doesn’t stop there. Steel sides give the board plenty of protection, even if you are hitting the rails hard in the fun park, and the bi-ax fibreglass lay-up gives even more flexibility. The even core profile of the board means that stability is one of the main principles behind the design of the board. In terms of ride, this board really is a great all rounder. Whether you just want to cruise down the slopes, or you really want to put it through its paces, it will reward you. 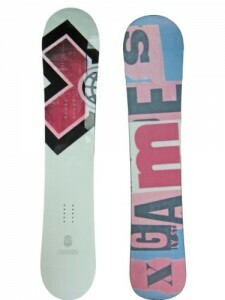 This Xgames Freeride Sidecap Snowboard really is the bees’ knees! It’s so comfortable on the slopes, so it doesn’t really matter what level you are at in your snowboarding. The very best riders might expect a little more, but for the beginner or intermediate rider, this is going to do the job with ease. It looks great, is light weight, and should be strong enough to last you for years, so we can only whole heartedly recommend the Xgames Freeride Sidecap Snowboard! This entry was posted in Other, Reviews, Snowboarding, Snowboards and tagged Snowboard, X Games, XGames, Xgames Freeride Sidecap Snowboard. Bookmark the permalink.